Leeds United's Samuel Saiz lines up his shot to score the opening goal of the match at Barnsley. Picture: James Hardisty. First half goals from Samuel Saiz and Ezgjan Alioski proved enough for Leeds United to bounce back from their midweek defeat with victory in a Yorkshire derby at Barnsley. A 2-0 success was as comfortable as it gets for Leeds at Oakwell and the victory was never in doubt once they had gone ahead in the first half. Head coach Thomas Christiansen made three changes to his team after the defeat at Wolves, changing goalkeepers again with Felix Wiedwald recalled, as well as bringing in Caleb Ekuban for Kemar Roofe up front and Eunan O’Kane back for the suspended Ronaldo Vieira in midfield. Ekuban was almost in for a goal in the opening minute as got onto an Alioski cross into the box, but his shot was blocked and went out for the first of three successive corners. Nothing came of the early pressure, but on 11 minutes Alioski was not far away with a volley from the edge of the box after home keeper Adam Davies had punched away a corner. Little of note followed for a spell, apart from a shoving match between Luke Ayling and Harvey Barnes after the Barnsley man had taken exception to the United full-back’s attempt to win a penalty with an easy fall in the box. Other players got involved as tempers briefly flared and the instigators were booked. It was somewhat out of the blue when Leeds went ahead on 23 minutes as Alioski found Saiz in space 40 yards out from goal and the Spanish wizard ran at a back-tracking defence before beating Davies with a shot from the edge of the box. Kalvin Phillips shot wide from the edge of the area soon after when teed up by Alioski following a fine crossfield pass by Ekuban. With Leeds in control now Barnsley’s frustrations were growing and they were lucky to keep 11 on the pitch when Barnes rugby tackled Phillips and avoided a second caution. Referee Andrew Madley let him off the hook again later in the half following another foul, but gave him a big talking to. Joe Williams did manage a shot for the home side, but was well wide from 25 yards out. Moments later Saiz hit a shot over from distance at the other end. Barnsley’s first real threat on goal came in the 40th minute as Liam Lindsay headed wide from a free-kick. However, Leeds finished the half strongly. Ekuban forced a save from Davies with a low strike from 18 yards out then in the third minute of added time Alioski made it 2-0 with a lovely curling shot from the edge of the box. It was no surprise to see Barnes not returning for the second half after Barnsley boss Paul Heckingbottom replaced him with Ike Ugbo and the home side switched to two up front. It brought more urgency into the home side’s play, but United still had a fair amount of control of the game as they closed down well all over the pitch and in Saiz and Alioski had the two players who looked most likely to unlock defences. Pablo Hernandez saw a free-kick deflected off a head in the defensive wall to leave Davies wrong-footed but relieved to see the ball go just past the post. Saiz got in behind the defence, but saw his low cross fortunately deflected back to keeper Davies by a defender with Ekuban ready to pounce. Williams blasted a volley wide at the other end and Ugbo could only get a weak header in from a free-kick to give Wiedwald his first and easiest save. With the action hotting up Ekuban found space in the box and showed good feet only to hit his shot into the side netting. 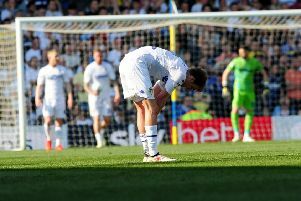 Liam Cooper got in a glancing header from a free-kick only to give Davies a comfortable save. Davies saved easily again to deny Ekuban while Alioski produced an acrobatic volley to meet Saiz’s cross only to send the ball over. Gary Gardner found himself in space near the Leeds box, but produced a weak shot that was easily saved. A dangerous low cross a minute later was superbly defended by Gaetano Berardi. But United showed they were still dangerous as Hernandez was not far over with an angled shot. Saiz then shot from the edge of the box only to see his effort deflected wide. Another good low ball into the box was well dealt with by Cooper and the Leeds goal remained intact to the finish, a clean sheet putting the icing on the cake to a good victory on a ground they have not enjoyed much success on. Leeds boss Christiansen was understandably pleased with the result and performance. He said: “We gave a good performance. “The way the players handled the game was good. We deserved the three points. “The statistics we had here with 18 matches and only two wins showed it was good to get a win here. “To go to half-time with that score was dangerous so our mission was to go for the goal again and kill off the game. “Saiz and Alioski are important players for the team and they did well, but our defensive line did well. “For me it’s another three points and for the players it was important for the confidence that they had already got back. It’s always important that you win and it was a derby. Barnsley: Davies, Yiadom, MacDonald, Lindsay, Fryers, Williams, Potts, Hammill (Hedges 76), Moncur (Gardner 45), Barnes (Ugbo 45), Bradshaw. Leeds: Wiedwald, Ayling, Jansson, Cooper, Berardi, O’Kane (Shaughnessy 58), Phillips, Alioski (Grot 88). Saiz, Hernandez, Ekuban (Roofe 80).